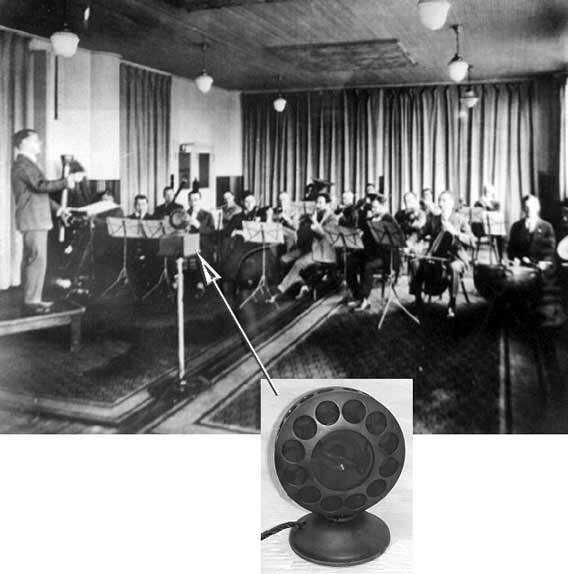 The Victor Orchestra recording in Building no 15, Camden, New Jersey in this 1925 photograph showing the new Western Electric recording process. Note the single microphone on a stand. This could be a Western Electric condenser microphone in a Western Electric 1B or 1C housing with amplification and impedance matching in the box at the base of the microphone or, it might be a Western Electric carbon button microphone with batteries in the box - experts don't agree. The Western Electric 394 condenser "transmitter" was introduced in late 1926/early 1927 2. So, this photo may show an earlier model condenser transmitter, perhaps the Western Electric Type 361, or it may be a Western Electric carbon microphone. The Western Electric 394 with superior frequency response and lower noise would be introduced into Western Electric recording in 1926/1927. On April 29, 1925, Leopold Stokowski and the Philadelphia Orchestra made the world's first electrical recording of a symphony orchestra: the Saint-Saëns Danse macabre, opus 40 . After this milestone in the history of the gramophone, Stokowski and the Philadelphia Orchestra went on to record three Russian works. The same day as the Danse macabre, they recorded Stokowski's abbreviated arrangement of the Polovtsian Dances from Borodin's opera "Prince Igor". Then, two weeks later on 15 May 1925, they recorded one side of music of Ippolitov-Ivanov: "In the Village" from Caucasian Sketches opus 10, which would be issued with the Borodin. That same day, and also they made a superb recording of the Tchaikovsky Marche Slave. With these recordings of early May, Stokowski and the Victor engineers began to take note of the abilities of the Western Electric electrical recording system ability to cope with percussion, to register the bass frequencies, and, with the microphone replacing the recording horn, to accommodate a larger orchestra. Gradually, Stokowski and the engineers began to abandon the acoustic instrumental arrangements as they discovered the abilities of the new recording process. They also added to the number of musicians. For this reason, the May through December 1925 recordings represented gradual further progress in successful new orchestral reproduction never before heard from a gramophone record. On April 29, 1925, Stokowski and the Philadelphia Orchestra recorded their second electrical recording, the same day as the Danse macabre. This disk was labeled as being Borodin's "Polovetzki Dance", wich was Stokowski's arrangement of the "Polovtsian Dances" music from Prince Igor. This Stokowski arrangement abridged the sections of Polovtsian Dances to fit on one side of a Victor Red Seal 12 inch (30 cm) side. 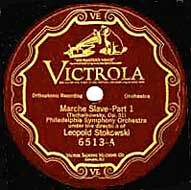 Twelve years later, on April 5, 1937, Stokowski and the Philadelphia Orchestra again recorded a 1937 Stokowski arrangement of music from the "Polovtsian Dances" ; this time with the music taking up four 78 RPM sides and being sixteen and one half minutes - compared with this 1925 side of four minutes. Stokowski and the Philadelphia Orchestra had also several times tried, unsuccessfully, to record this music from Borodin's "Polovtsian Dances" using the acoustic recording process. Recordings were cut on October 18 and 19, 1920 (four takes), and February 13, 1922 (a fifth take), none of which were approved by Stokowski. As in the Danse macabre, recorded at that same April 29 session, only 42 musicians were used, similar to previous acoustic recording sessions. There were 7 first violins, 4 second violins, 3 violas, and 2 celli, no string basses, 2 oboes, 1 English horn, 2 bassoons, 1 contra-bassoon, 3 clarinets, a bass saxophone, 3 flutes, 4 horns, 3 trumpets, 3 trombones, a tuba, harp, and a tympani 22. This was a reduced complement even though, for the first time, the electrical recording microphone did not restrict the possible space in which the recording equipment could pick up the musicians' sound, as had been the case with the acoustic horn had done. Again as in acoustic recordings, no string basses were used, and instead, a bass saxophone, now part of the Philadelphia Orchestra's listed complement, replaced the string basses, augmented by the tuba. A contra-bassoon reinfored the timpani. The Victor engineers in these first electrical recording sessions were cautiously using the same re-orchestration techniques necessary with acoustic recording. However, Stokowski and the engineers gradually restored the bass strings and percussion and augmented the number of musicians in later recordings, as they determined what would record best, through experience. Onr interesting aspect of this recording of the "Polovetzki Dance" is that since it was recorded with the techniques of acoustic discs; i.e. a greatly reduced orchestra, with the music re-orchestrated to avoid bass strings and percussion, we can now hear, with the improved clarity of the electrical recording process what the performance arranged for the acoustic horn would have sounded like "live". This Borodin recording was issued the following September as Victor 12 inch (30 cm) Red Seal disk catalogue 6514 (it was not released by the Gramophone Company in Europe). The matrix number is CVE 32550-1 (and later CVE 32550-2), with the selection In the Village from the 1925 Ippolitov-Ivanov Caucasian Sketches on the other side. Two weeks after Stokowski made the world's first electrical recordings of symphonic music, with the Danse macabre and the Borodin selection, Stokowski and the Philadelphia Orchestra returned to Victor Building no 15 to record the Tchaikovsky Marche Slav. 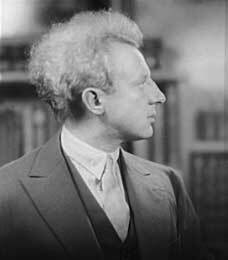 Having learned from the results of the April 1925 electrical recording sessions, Stokowski increased the orchestral complement, although it was still reduced: 7 first violins, 4 second violins, 3 violas, 2 cellos, 2 oboes, 1 English horn, 2 bassoons, 1 contra-bassoon, 3 clarinets, a bass saxophone, 3 flutes, 4 trumpets, 3 trombones, 4 horns, tuba, harp, and 2 drums 22. The addition of percussion can now be clearly heard (listen to the first minute of the recording). Still, the provision of bass scoring by tuba, bass saxophone and contra-bassoon can be heard clearly at about 3:00 into the recording. This recording was also sonically successful. In fact, this Marche Slave was perhaps the first orchestral recording of a symphony orchestra which sounded close to what might be heard in concert, rather than the "band of banjos" to which some listeners likened even the best acoustic recordings of symphony orchestras. Victor apparently recognized the improvement and recommended this recording to its record dealers as a demonstration disk for the new Victor Orthophonic Victrola machines coming out in 1925. That deep bass ostinato repeated during the first 30 seconds of this eight minute recording must have been most impressive on the new Orthophonic Victrola which, for the first time reproduced lower bass with volume and low distortion. In fact, this recording sold sufficiently well to remain in the Victor catalog well into the 1940s. To my ears, it is a performance superior both artistically and sonically to the 1942 NBC Symphony recording which replaced it in the Victor catalog. 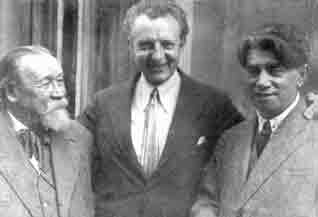 On May 15, 1925 following the completion of Marche Slave, Stokowski and the Orchestra returned to a work that he had performed at his first 1909 concerts in Paris and London: Ippolitov-Ivanov's Caucasian Sketches. This work, mainly forgotten in the concert hall today, was based on Ippolitov-Ivanov's research of folk music of the Caucasus. Stokowski also performed this work at his second Cincinnati Symphony concert in 1909, and at his first Philadelphia concert in 1912. He evidently felt it was a "sure fire" showpiece for the orchesta and for himself. During the acoustic era, Stokowski on May 15, 1922, recorded the fourth movement of the Caucasian Sketches: 'Procession of the Sardar'. Now, three years later, he recorded the second movement of the work, depicting life "In the Village". Again, the use of Philadelphia Orchestra musicians was improved: 7 first violins, 4 second violins, 3 violas, 2 cellos, no string basses, 2 oboes, 1 English horn, 2 bassoons, 1 contra-bassoon, 3 clarinets, a bass saxophone, 3 flutes, 4 trumpets, 3 trombones, 4 horns, tuba, harp, and 2 drums 22, Stokowski and the Victor engineers were learning how to improve electrical recordings and the sound and the performance are both very satisfying. In fact, this is my favorite recording of this work from any era. Stokowski presents this Ippolitov-Ivanov composition as a noble and inspired work. Many later performances by other famed conductors treat it as a light weight "pops" item, and even Stokowski's later recordings seem to me to have less depth, conviction and character than this beautiful 1925 accomplishment. Listen in particular to the opening interplay between the Concertmaster Thaddeus Rich with the prominent oboe solo of Marcel Tabuteau - magic! This is a great recording which transcends the decades which have since passed. This is also one of the last Philadelphia Orchestra recordings featuring Thaddeus Rich, who was to depart from the orchestra in 1926 subsequent to a falling out with Stokowski. Here, in this fine electrical recording, we can appreciate Thaddeus Rich in a way not fully possible in the faint images of the previous acoustic recordings. Another beautiful solo is the extended English horn - viola passage played by Peter Henkelman, English horn, with Romain Verney, viola. Henkelman, born in the Netherlands in 1874, was about to leave the Orchestra at the end of the 1924-1925 season to go to the New York Symphony, after having played in the Philadelphia Orchestra oboe section for 24 seasons 1901-1925. Roman Verney also left the Orchestra at the end of the 1924-1925 season to go to the San Francisco Symphony where he was Principal viola under Alfred Hertz. This recording was issued in September, 1925 on Victor Red Seal 12 inch disk 6514, which also featured the Borodin 'Polovetzki Dance' on the other side. The matrix number was CVE 32801-2. In the reproduction below, you can hear, in the background faintly what seems to be the sound artifact of the motion of the electrical cutting head, still being pulled by weights (rather than driven by an electric motor). This subtlety would not have been captured by the acoustic recording apparatus, and was soon eliminated by Victor or possibly Western Electric engineers. Click on the link below to listen to (or download) 'In the Village'. 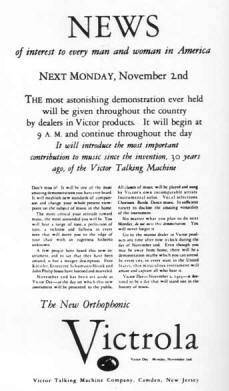 November 2, 1925 - "Victory Day"
These new electrical recordings coincided with a decision by the Victor Talking Machine Company to mount a major sales push for the new recording process, which Victor and other companies had abstained from doing earlier in 1925. Victor initiated the famous "Victory Day" promotion of November 2, 1925, in which Victor is said to have spent more than $1 million in advertising and promotion, a huge sum of money at that time. This was also a real financial gamble, particularly since Victor had lost money in 1924, and would lose money again in 1925 as a consequence of this promotional spend. This change was a success. During 1926, the losses of 1925 of $26.5 million were fully recovered, with unprecedented sales of Victor records and of Victrola machines. The reproduction of the folded horn Victrola was greatly improved over previous equipment, particularly in the bass spectrum 100 hertz to 600 hertz. However, these were still totally acoustic reproduction devices. They used no electrical amplification or equalization. Only with the introduction of the Electrola and the Radiola, both having electrical amplification and electrical loudspeaker was the full potential of the new electrical recordings realized. The Electrola was an electrical reproducer with electromagnetic cone speakers. The Radiola was similar to the Electrola, with the addition of an RCA radio receiver chassis. In 1925 (May 14, 15, October 6, 7, and December 8,1925) Stokowski made his first electrical recording of a symphony: the Dvorak Symphony no 9 "From the New World", opus 95, which had been one of Stokowski's most successful works in concert. This 1925 electrical recording continued to use tuba reinforcement to the bass and a reduced orchestral complement. Taking part in this recording were: 7 first violins, 4 second violins, 3 violas, 2 cellos, 2 oboes, 1 English horn, 2 bassoons, 1 contra-bassoon, 3 clarinets, 3 flutes, 1 bass saxophone, 4 trumpets, 3 trombones, 4 horns, 1 tuba, a harp, and 2 drums 22. So again, string basses are omitted, and the tuba, a bass saxophone and contra-bassoon are used to provide the bass line as in the acoustic recordings. To illustrate the reduced string complement, in the 1927 re-recording of this symphony two years later, the 1925 completment of 7 first violins, 4 second violins, 3 violas, 2 cellos and no string basses will grow to 17 first violins, 18 second violins, 13 violas, 12 cellos and 10 string basses --- in other words the full Philadelphia Orchestra complement 22. However, in 1925 there is some restrained use of percussion, not present in acoustic recordings. Also, sound was improved, although not with the open and atmospheric sound which would be achieved in the 1926 recordings done the next year in the Academy of Music in Philadelphia. Somewhat more string portamento is featured here than in later Dvorak works, but it is evocative of the playing of that era, and not unattractive. The Philadelphia Orchestra playing continues to be superior, in my opinion in tone and ensemble to the contemporary European orchestras, at least as judged by the surviving recordings of the period. By late 1925, Philadelphia Orchestra recordings had not yet begun in the Academy of Music, and these sides were presumably made in the Victor Camden studio, or "recording laboratory" as Victor referred to it, located in Building number 15. I have not seen documentation of the Building 15 location, but the reasoning for this assumption is described in "Location of the First Electrical Recording Studio in Camden". The Dvorak "New World" was recorded on five Victor Red Seal 12 inch (30 cm) discs: Victor 6565, 6566, 6567, 6568, 6569, and 6743 which could for a time be purchased individually. However, the recording was now also offered packaged in a handsome multi-disk album labeled "Music Arts Library", as shown below. In this way, the New World recording became the first packaging of what would later develop into the "Victor Musical Masterpiece" series of albums. 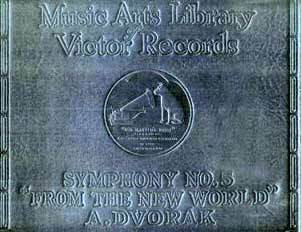 Beginning in 1926, records of a work or works were placed in the Victor Musical Masterpiece handsomely bound albums, and this 1925 Dvorak New World became the first of this famous series, listed as M-1. Interesting, if somewhat confusing is that when Victor re-recorded the New World Symphony in 1927, it used the same album number, M-1 and the same disk numbers 6565, 6566, 6567, 6568, and 6569, and even the same matrix numbers for the 1927 recording. Fortunately, only a few seconds of listening will allow any listener to discern the far superior reproduction of the 1927 recording, compared with its predecessor, precluding any confusion. To listen to (or download) these pioneering first electrical recordings of the Dvorak Symphony "From the New World", click on the links below. The oboe solo of Philadelphia Orchestra Principal oboe Marcel Tabuteau in the second movement: 'Largo' is particularly sensitive and beautiful. 1 Jones, W. C. Condenser and Carbon Microphones: Their Construction and Use. Journal of the Society of Motion Picture Engineers. January, 1931. 2 see the background information on this subject in: 1925 Other Electrical Recordings Stokowski.htm. and also pages 116-127. Copeland, Peter. Manual of Analogue Sound Restoration Techniques. British Library Sound Archive. London, UK. February, 2001. 4 Fagen, M.D., ed. A History of Engineering and Science in the Bell System: The Early Years (1875-1925). New York: Bell Telephone Laboratories, 1975. 9 page 94 Burns, R. W. op. cit. 10 page 93 Burns, R. W. op. cit. 13 Sutton, Allan. Recording the 'Twenties. The Evolution of the American Recording Industry, 1920-29. Mainspring Press. Denver, Colorado 2008. ISBN 978-0-9772735-4-6. 16 Thanks to Christine Rankovic, Ph. D. for this information on Rogers Harrison Galt. 17 Jones, W. C. Condenser and Carbon Microphones: Their Construction and Use. Journal of the Society of Motion Picture Engineers. : January, 1931. 20 page 334-348. Maxfield, J. P. and Harrison, H. C. Methods of High Quality Recording and Reproducing of Music and Speech Based on Telephone Research. Transaction of the American Institute of Electrical Engineers. February 1926. 21 Frederick, H. A. The Development of the Microphone. Journal of the Acoustical Society of America. July, 1931. New York, New York.